New show opening at Hot Tap this week - all tickets a fiver! If you're not making a tidy second income turning your spare room into a baby B&B you might need our economical suggestions for entertainment this week. 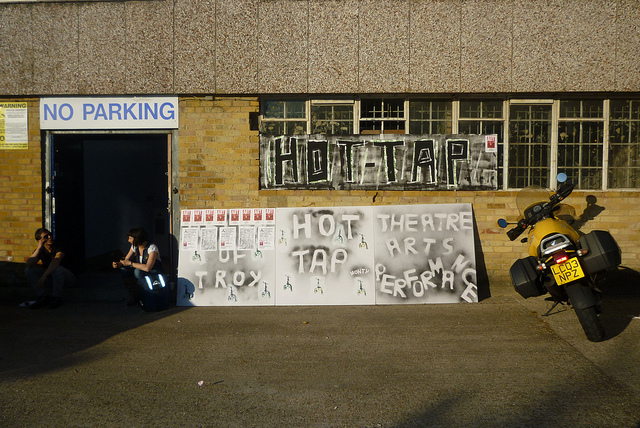 Tonight: The Disappearing Act, a one man show, opens tonight at Hot Tap Theatre, 20-32 Goodwood Road, New Cross, SE14 6BL, 8pm. All tickets £5. Until 27 November. The London Jazz Festival Barbican Freestage hosts Before Chucho Valdes & The Afro Cuban Messengers + Ibrahim Maalouf between 6-7pm. More freestage events over the weekend. Knees Up is piano karaoke in an east end boozer with the Pub Piano Champion, Cliff Oliver. Free entry, 8-11pm at The Royal Sovereign, 64 Northwold Road E5 8RL. Opening night of the Underwire Film Festival celebrating the cinematic talent of women is just £5. 7pm at Kobi Nazrul Centre, 30 Hanbury Street, E1 6QR. Friday: The Lord Mayor lights up Leadenhall Market to close their Winter Festival between 5-6pm. Saturday: 100 artists open their studios Second Floor Studios and Arts, Mellish Industrial Estate, Harrington Way (off Warspite Rd), Woolwich, London SE18 5NR between 11am-6pm (also Sunday). arts and crafts, mushroom prints, a mushroom quiz trail and more. 12 Camley Street, Kings Cross NW1 0PW (and Sunday). The Hammerswish invites you to exchange clothes, accessories and more at the The Stone Mason's Arms, 54 Cambridge Grove, W6. Drop off from 2pm, party from 3pm. Free but please RSVP. Explore Intimacy at The Others, 6-8 Manor Road, Stoke Newington, N16 5SA. £5 from 3pm. Sunday: Have an Adventure in Sound in the Clore Ballroom at the Royal Festival Hall with Zed-U & Matthew Bourne & Barre Phillips at 2pm (part of the London Jazz Festival and free). Get Hands on with Archaeology at Museum of London with an object handling session for grown ups throughout the afternoon. Monday: The Secret Chiefs meet at the Devereux to discuss Frau Holle: Only A Winter Goddess? And Who Is Father Christmas, Anyway? from 8pm. off Essex Street, London WC2R 3JJ, talk starts 8.30pm, £2. Idiots of Ants try out sketch comedy radio show work in progress at Pleasance Islington, 8pm. £5. Tuesday: Attend the free performance of Or Am I Alone? by Cardboard Citizens theatre company at Amnesty International Human Rights Action Centre, 17 - 25 New Inn Yard, London EC2A 3EA. Free but please book. Starts 7pm. Wednesday: The Duke Mitchell Film Club screens 70s Czech gem "Tomorrow I'll Wake Up and Scald Myself With Tea". Free entry, film starts at 8pm. The Kings Cross Social, 2 Brittannia Street, Kings Cross, WC1X 9JE.